Don't be a delusional salmon fisher and think that just because you're delivering a nice line and spacing each swing of the fly correctly without success that there's no fish present. Stubborn resident salmon need a degree of 'winding up' to be caught so here's my take on that fact.. Imagine for one minute that you're salmon lying up on the cooler riverbed of a deep holding pool. All you're seeing is a systematic 'red arrows' display of flies swinging over your head day after day at various times of the morning, afternoon & evening. How easy would it be for you to completely 'switch off' especially after the excitement of the last spate died away weeks ago as did the buzz of fresh water in your nostrils from coming home from the sea several weeks before that. It's no wonder salmon lose all interest in a fly from time to time if you really think about it. When salmon are present in a pool and not cooperating the first thing you must do is to bin the excuse of blaming the weather and water conditions. 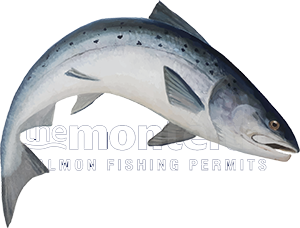 Most angler's heads go down far too easily and if they were faced with the same perils that Atlantic salmon are faced with throughout their oceanic & river lives they'd have been extinct years ago! The salmon pool approach mentality you must adopt when fish are not cooperating has to be 100% sub surface and focussed around what tactical adjustments can you make to the swim depth of your fly to get it right into that square foot of water right in front of a salmon's nose. Juvenile salmon parr are territorial and adult fish develops the same 'memory recall' mindset when back in fresh water. If an annoying foreign object that's simulating a live creature comes too close to even the most unresponsive salmon you're then giving that fish two choices. The first choice is to get away from the fly by moving off its lie or the second more likely option is for the fish to attack it! For you to corner a fish like that to force a decision you really need to know your salmon pool and exactly what sink tip configuration is required to place your fly right onto the nose of resident fish without snagging up too often on the riverbed. Most anglers are completely unaware of the depth of their salmon fly and often make wrong assumptions that the fly is swimming much deeper than it really is because the sink tip packaging says 'type 6' or 'type 10' (inch per second). That entire badging system that line manufacturer's use gives the wrong impression to anglers and pertains to a 1 inch section of sink tip material being dropped in a glass of still water which obviously has zero 'jacking up' ability like the full sink tip version would have in a flowing salmon pool. If you're not feeling the occasional tap of the riverbed when fishing the fly deep like this then make the assumption that your fly isn't fishing deep enough and try a denser or longer sink tip. Sure occasionally tweaking the riverbed is annoying but if you've got your depth perception just right the next tweak on your fly line could easily not be the riverbed!